I absolutely love hiking! Being outside all day, enjoying nature and being physically active beat any day of sitting in an office behind a laptop. I hiked a lot during my 5 month trip, I did a 3-day hike through the rice terraces of Batad in the Philippines, climbed Mount Doom on the North Island of New Zealand and hiked many other tracks on both the North and South Island of New Zealand. 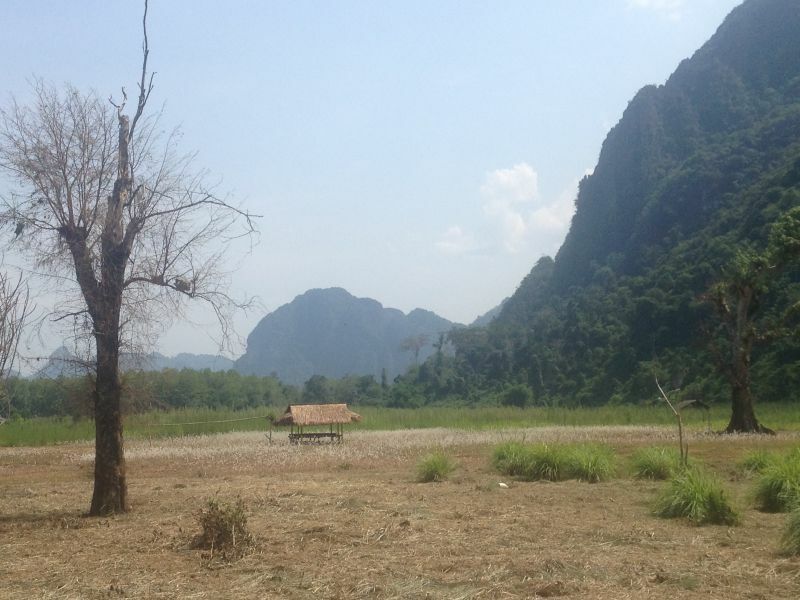 The major difference with the hike in Vang Vieng was the temperature… While the weather had been amazing for pretty much all our previous hikes, we had not hiked in very hot weather… YET;-). Even during the hike in Batad the temperature was quite comfortable because the villages and rice terraces are about 1500 meters above sea level. 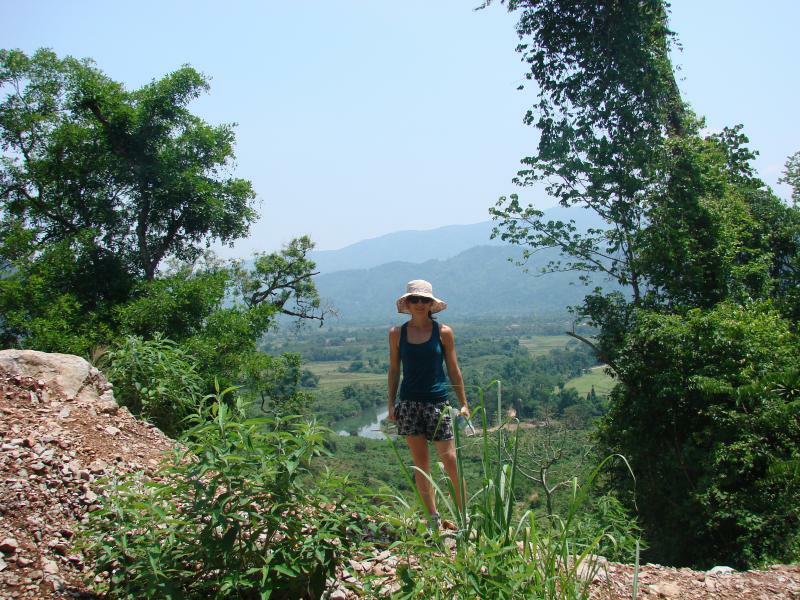 How very different than the hike we did in Vang Vieng! The day we arrived in Vang Vieng it wasn’t very hot and a little cloudy so we enthusiastically booked a hiking tour at our hotel. The day of the hike the sky is a stunning blue. And even at 8 in the morning it’s already pretty warm… But we are nothing if not committed so we hop into the van picking us up for the hike and off we went. There are lots of other people in the van, but none of them are wearing suitable shoes for hiking. After driving for a while, the van pulls over at the stat of a little dirt road and a friendly Lao calls our names. Turns out he is our guide and we are the only hikers. The rest of the people are headed to the tubing drop-off point, also a fun activity and definitely more suitable for the weather;-). With two 1,5 liter bottles each (so 4 in total!) we set off, following our guide over the dusty road. Our guide tells us a little about himself and his family. We learn that he is just 2 years older than we are and the father of 4 children! Such a different life than our own! He also tells us more about the schooling system in Laos, very interesting. I am very happy with our plentiful water supply because I sincerely think I have never sweated so much in my entire life. 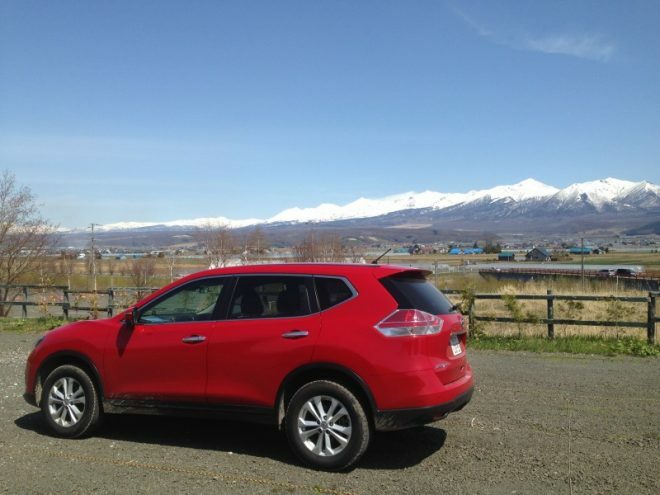 But the surrounding nature is totally worth it! After a while we come across a concrete construction, our guide tells us this was supposed to become a bridge but the money ran out… He makes a call to someone who usually takes people across the river in a little boat, but no answer. 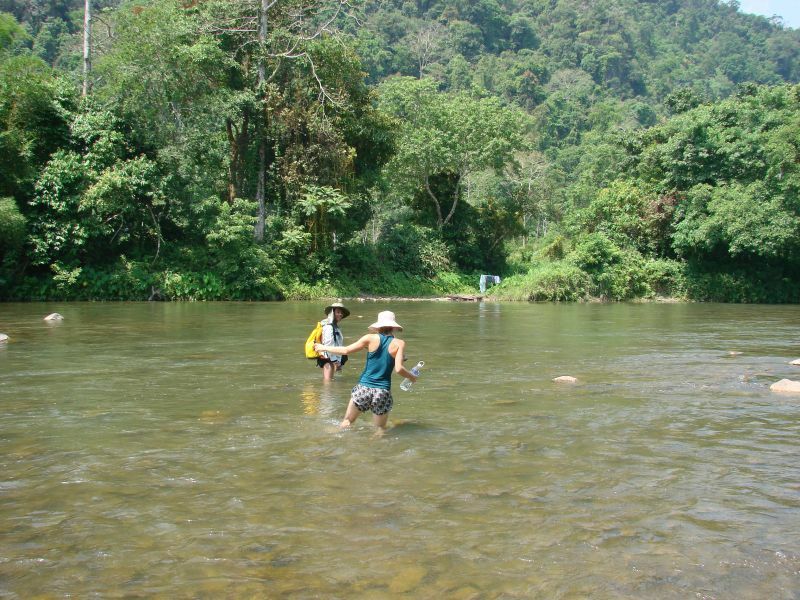 Not a problem, he says to us, we’ll just cross a little further downstream where the river is not so deep. And the boat that was supposed to take us across… I didn’t mind walking a little further and cross the river on foot;-). Well, it may not be deep but it’s not easy getting across! The stones are sharp and slippery and the water is streaming quite fast! With help of our friendly guide we both make it across:-). Check out the steps on the tree, our guide told us these steps are used to get to the beehives hanging in this massive tree. Would you dare to climb it…? We walk between steep limestone cliffs until we reach a tiny trail through the dense green jungle leading to… a waterfall! We both immediately jump in the water, so good to cool off! While our guide prepares a delicious barbeque lunch (nomnom) we jump from the rocks into our private pool, splashing around and taking pictures of our piece of paradise. I vividly remember sitting on a rock, listening to the calming sound of the waterfall and trying to absorb every minute of that blissful moment. For one second I thought about how next month I would be back at my office but I immediately pushed that thought away and focused on how completely happy I was in that moment, enjoying just sitting there…. We have a delicious lunch with BBQ chicken, vegetables, rice and baguette and reluctantly leave this piece of paradise to start the journey back. We are now mostly descending, looking down over the valleys and hiking through the tall grass. The hike ends at a small bamboo bridge. And just like the bamboo bridge in Luang Prabang this bridge is rebuild after every rainy season, only to be washed away by the water during the next one. 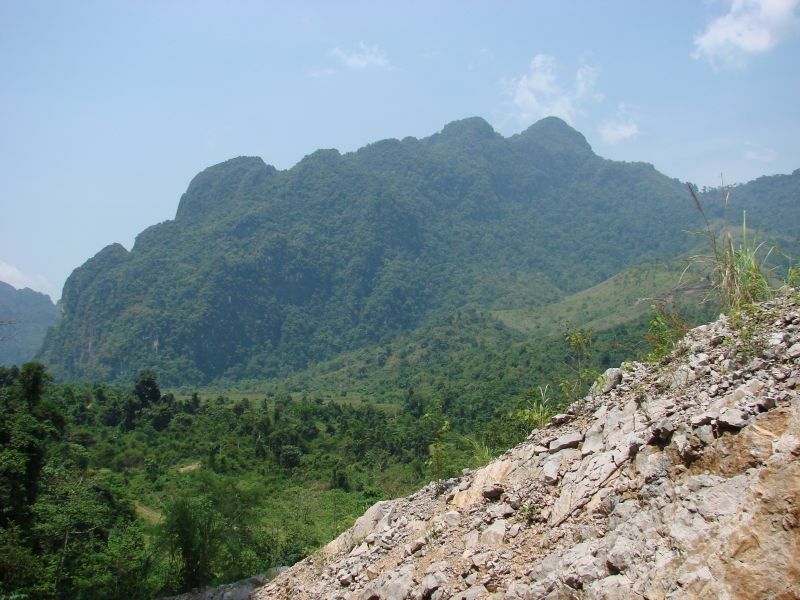 The circle of life in Laos… an amazing country! 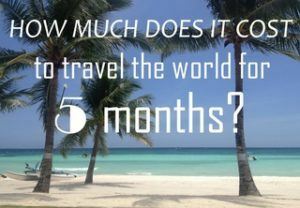 Read more about my trip in Laos in my 2-week itinerary and my budget breakdown infographic. Also check out this post about the best things to do in Laos on a first time visit. Have you ever been to a place that felt like paradise? Oh I wish I did this when I was in Vang Vieng!! I’m glad you pushed out thoughts of your office. Live in the now and enjoy each moment! There is always next time Anna;-) And very true, cheers to living in the moment! 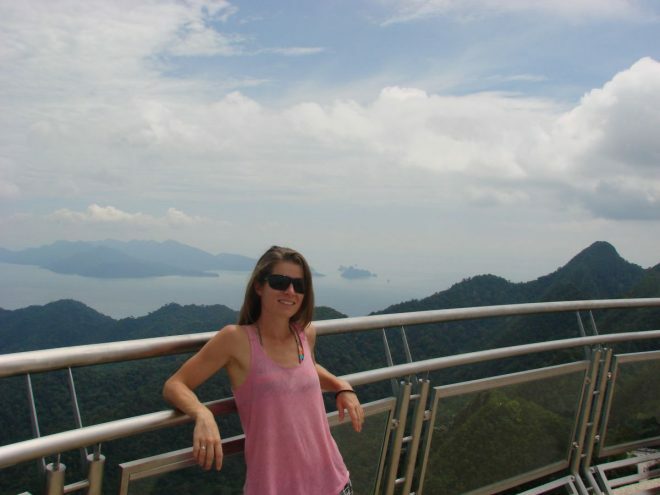 I also love hiking and have done some pretty good trails (including in New Zealand!). And you’re right, hiking with warm temperatures (and humidity I guess) it’s not really easy but can also be quite good..when you find a waterfall or a nice looking lunch! Wow, what a great hike! The views were fabulous and the waterfall was just the cherry on top. 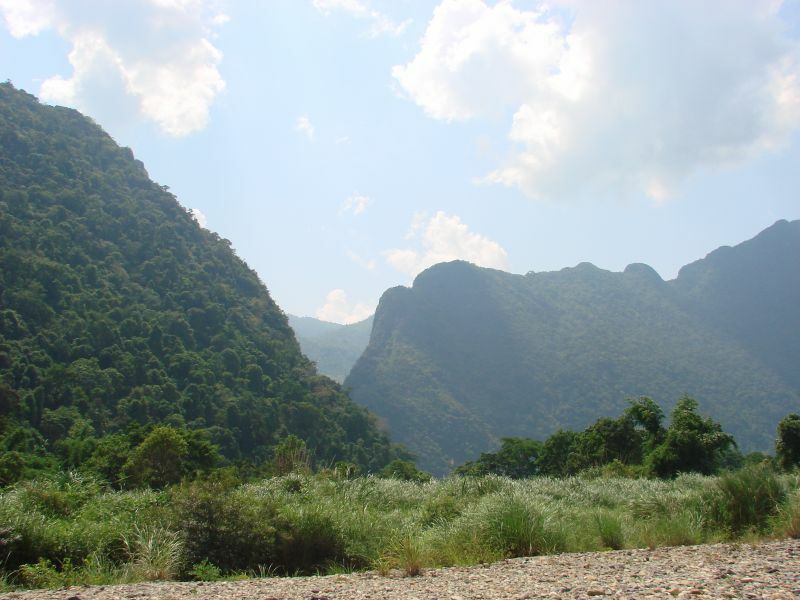 Sounds like a great hike Lotte – I can’t decide which view I would enjoy more – the view of the stunning scenery or that of the BBQ after such a long hike! Seriously, the kebabs look so good! I could definitely go for a private lagoon dip right now! It’s definitely a tie between the views, the waterfall and the delicious lunch;-) And all of that in 1 day! That is a gorgeous hiking spot! You made the most of it! Loved that you were cooking the kebabs, too! So much beauty around you! I’m not much of a hiker but every time I read a post about hiking I think I have to do it more! Just go out and enjoy the nature.. I really should start doing that! What a gorgeous hike! Hiking is always one of our favorite adventures, and this one looks so great, especially with the beautiful mountain scenery. I would have loved to jump in the water, too–always so refreshing on a hot hike! Hiked Batad, too!!! OMG, couldn’t have done this hot hike! But the waterfall must have felt like paradise! And you had such good food!!! Congrats! Oh I am so jealous Lotte! This looks amazing. We were wanting to go to Vietnam this year but this makes me consider Laos instead. You were lucky to get the guide to yourself. How high was that waterfall? Not sure I would have been brave enough to jump. Nor fit enough to hike ha! It was such a gorgeous hike! Crossing the river was so much fun, but I agree stripping down would probably have been a faster solution;-). I would love to visit Nepal, hiking there is one of my bucket list items… Plus, I think after the earthquake the people can use all the support they can get and you can say whatever you want about tourism, it does provide jobs and money! Hi! I found your blog via google. 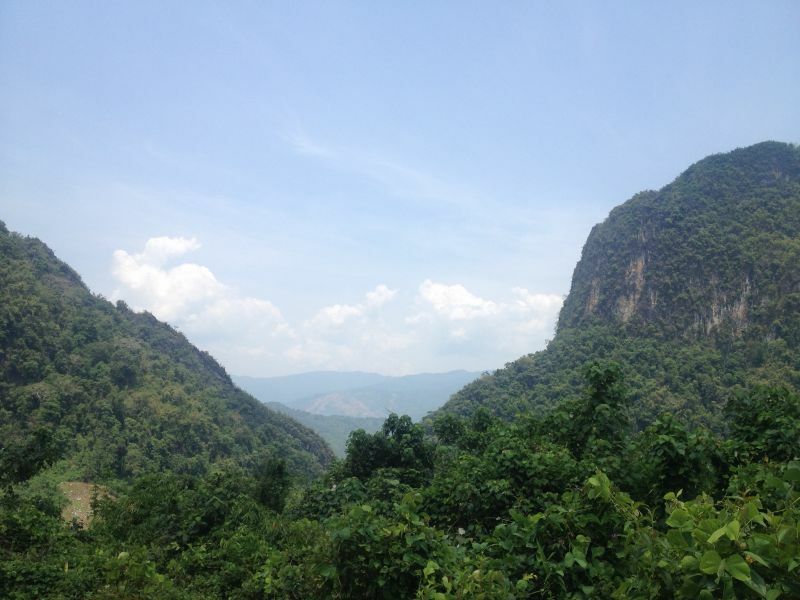 I’m in Vang Vieng now and love to hike! What compant did you use? Hi Dominique, how is Vang Vieng treating you? Beautiful place, isn’t it:-). 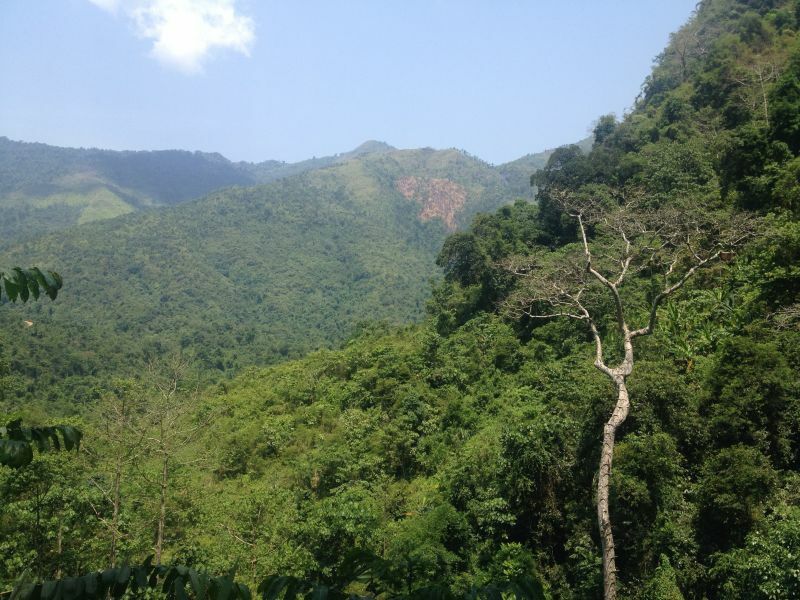 We booked our hike via our hotel, the Boutique Hotel in Vang Vieng. We paid 150.000LAK per person (including water, a guide, a BBQ lunch and transport). Let me know if you have any questions! 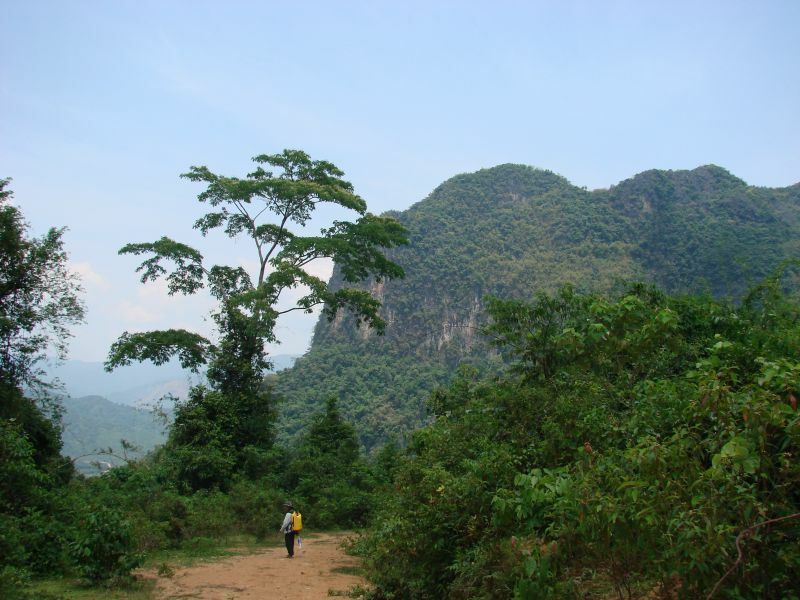 I love your story about your hiking experience in Vang Vieng. I am in Vang Vieng now , do you remember some details like the company name / the name of the hike / the name of the village where you started hiking ? 1. 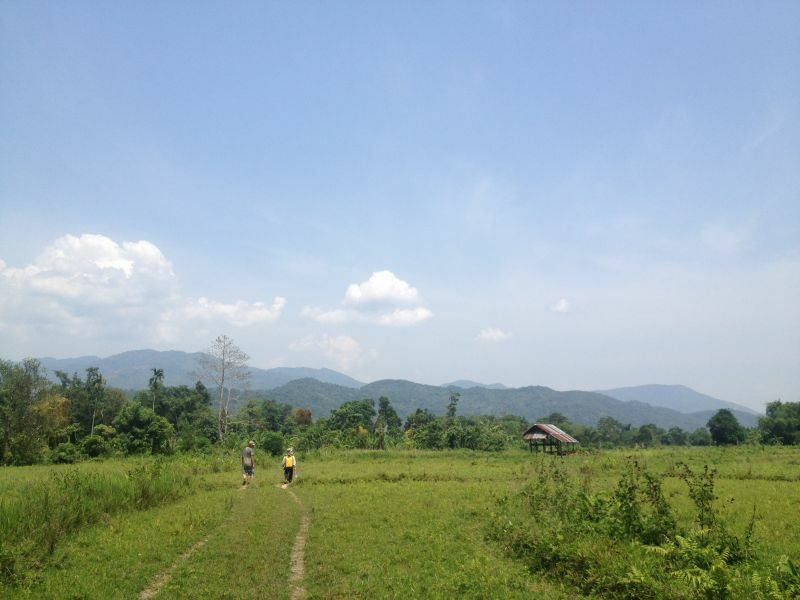 Company name: we booked our hike via our hotel, the Boutique Hotel in Vang Vieng. We paid 150.000LAK per person (including water, a guide, a BBQ lunch and transport). 2. Name of the hike: I don’t know the name of the hike but if you show the Boutique Hotel the waterfall picture they will know which hike you want to do. 3. Name of village where we started hiking: we were picked up in Vang Vieng by a tuktuk and dropped off on a dirt road with our guide. Hi there! Can I have the contacts of your trekking guide for Laos? Thanks!